As a bit of a chocoholic, I definitely find it difficult to resist giving into temptation where chocolate bars are concerned. Particularly if I’m trying to cut down on my sugar intake, I’ll often find myself feeling guilty if I grab a bar of Dairy Milk, or indulge in a brownie from a coffee shop – though it’s definitely a necessary evil at times, and good to give into those crazy cravings! But Lee Stafford has conjured a quick solution for any chocolate lovers out there who’re looking for a guilt-free, fat-free, chocolate fix. 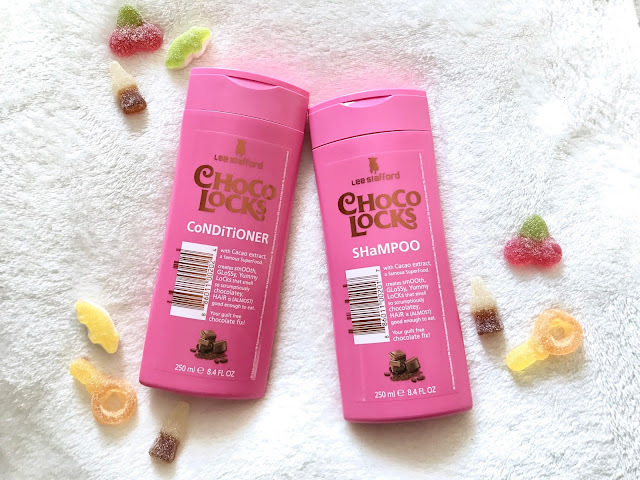 The brand has recently just brought out a chocolate inspired collection, featuring a full range of hair care products including a chocolate hair shake and gloss. Since I’m currently working through a number of hair products at home, I didn’t race to buy up the full collection in Boots. 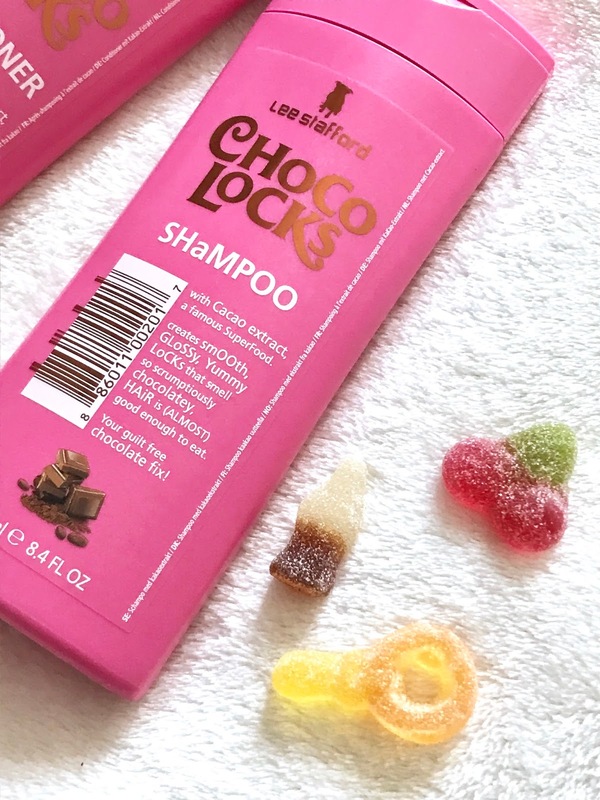 Instead I picked up the Lee Stafford CHoCo LoCKs Hair Shampoo & Conditioner, in the hopes of achieving the full chocolate hair experience. The packaging is a gorgeous candy pink, and the shape of the bottles themselves are very rectangular and flat, perhaps alluding to the shape of an actual chocolate bar. It definitely jumped off the shelf when I saw it, and totally looks insta-worthy (always a win). The smell is very sweet and definitely chocolatey. To me it smells like a chocolate yoghurt, and I probably wouldn’t blame you if you felt like it fitted more squeezed onto an ice cream sundae, over being kept in your bathroom cabinet! I feel like this shampoo probably wouldn’t be suited to someone who washes their hair daily, I know I’d definitely find the scent to be too sickly. But to mix up your hair routine, or for those ladies who totally endorse dry shampoo and will skip a couple of hair wash days (*waves* hello! ), then this might be perfect for you. In terms of how the scent lasts on your hair, I personally haven't noticed it to have an overly recognisable chocolate fragrance. It's definitely sweet, with vanilla-esque undertones, but definitely not that chocolate mousse smell straight from the bottle. In regards to how my hair felt after using the products, I'm pretty impressed. I've got really long, straight brown hair that can often look a little flat. The shampoo and conditioner (used liberally on the lengths) created a gorgeous shine and lustre to my locks. I have to admit that my hair didn't have that much volume post-wash, but that's nothing that couldn't be fixed with a little styling and volume products. In my eyes Lee Stafford has done it again! Following the success of his coconut hair-care products, this is another 'good enough to eat' range that I'm totally here for. 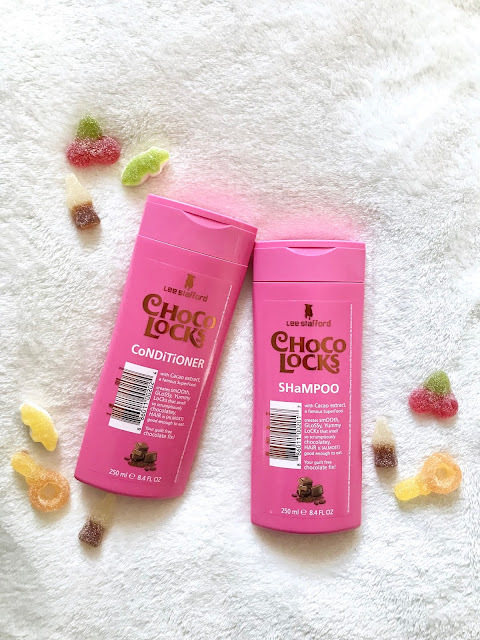 In all honesty, I probably wouldn't repeat buy this hair care set, but not because I didn't like it, more because my favourite shampoo & conditioners have more fruity, less sweet fragrances. To me there's nothing nicer than having tropical hair! 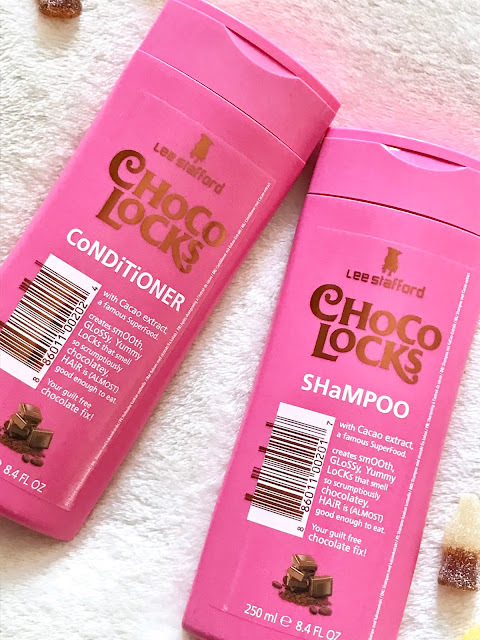 Have you tried the Lee Stafford CHoCo LoCKs Hair Shampoo & Conditioner yet? Let me know your thoughts on chocolate-scented shampoo! At this point in the year, after a long winter and no sunshine, my complexion can often end up looking a little flat. Whilst bronzer and highlighter are must-haves to lift my pale skin, I couldn’t be without blush to give my skin a ‘just worked out’ glow. Over the years I’ve remained a firm believer that powder blush is best. I can probably track this decision right back to my teen years when a Maybelline cream blush worked its way into my makeup bag, and I definitely looked more clown than cool with it on. Hard to apply, sticky residual feeling and a sheen that looked more sweaty than dewy, it just was a look I never wanted to replicate again. Ever. I’ve worked my way through plenty of blush palettes from Estée Lauder to Benefit, and although I’m a fan, I’ve always had one tiny complaint about powder blushes – though it’s never been bad enough to stop me using them. I find they always oxidise around midday and end up looking more orange/peach than pink. As I said, nothing major, more mildly annoying. So when Glossier hit the UK last year, so confident in my powder blush, the brand’s Cloud Paint wasn’t even on my radar. 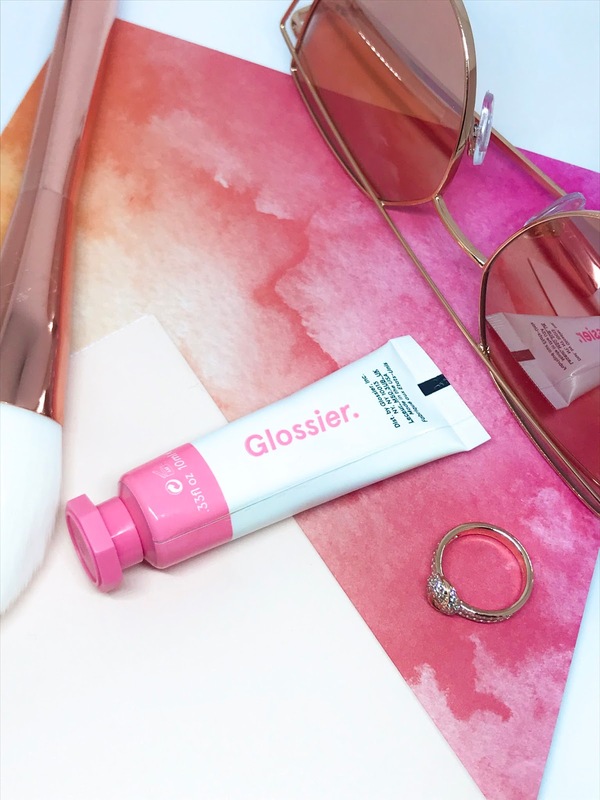 But after seeing so many bloggers and beauty gurus using them on Instagram, and having been impressed with Glossier’s other products myself, I decided to order them and take the plunge. I opted for Puff and Beam, a gorgeous bubble gum pink and a delicate peach shade. From testing the colours, I've definitely found the shade Puff to be my favourite and more complementary to my current pale skin. It has a very natural pink hue that truly looks like the perfect amount of glow, and not that beetroot head look that other blushes can give. It's not to say I don't like the colour Beam, but for my current colourings - the coral/pink hue is just too warm for me right now, I feel Beam will be my go-to in the summer when I've got a little bit of a tan going. Application wise I was super impressed, the blush delicately patted onto my skin, over foundation and powder bronzer, and didn't slide about removing it. Instead it blended beautifully and added a sheer, watercolour style coverage and colour that looked like I was glowing from the inside. One complaint about this seemingly perfect blush though, is its longevity. Maybe it's the harsh winter weather we're experiencing at the moment, but I haven't managed to get this blush to stay past midday, even with a primer. It just sort of disappears, leaving me looking like it'd never been applied, so it's definitely worth taking it with you on the go to re-apply. That said, the tubes are pretty tiny too, and though you only need to use a small amount to get the desired look, if you're re-applying twice a day I reckon you'll get through a tube in no time at all. Perfect for creating a natural, 'inner glow' that just exudes a healthy lifestyle, or dabbing on along with Brow Boy for some added confidence at the gym, I'm a big fan of these blushes now. I can't wait until hotter summer weather rolls around, to see if these last better in a dryer, hotter environment. 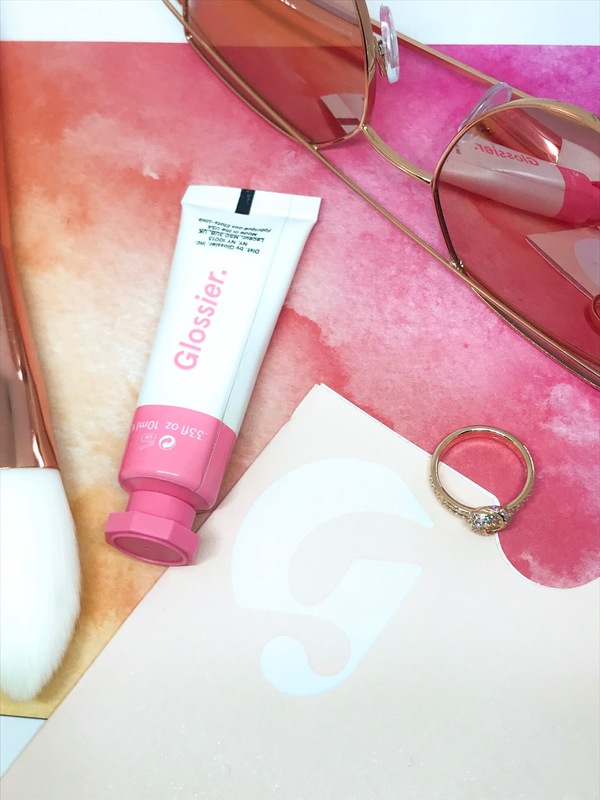 Have you tried Glossier's Cloud Paints yet? If so what are your thoughts on their colours and longevity? S/S18 Spring Colours - Saying YES to Yellow! For years I've been a self confessed addict of black. The easiest way to look elegant and chic, as well as disguise any lumps and bumps when you're not quite feeling yourself, it was always my go-to shade. Amongst my friends it was always a running joke that I'd turn up in a monochromatic ensemble, and a good 90% of my work attire was black too. But over the last few months I've found myself embracing colour properly for the first time. I'm beginning to let go of the preconceptions that were seemingly drilled into me about colour. "Pastel shades make you look pale, yellow can be very insipid, pink is too immature and girly" - these are just a few colour clichés, when in matter of fact none of it should matter. So what if I look pale? It's winter, I am. Pink is too girly? Well guess what, I am a female. You only have to look at the magazines and catwalks to see that designers are constantly pushing the boundaries of design, clashing prints, blending loud colours and crafting unusual shapes. So why not find yourself being inspired by what your heart wants, instead of what you think you should look like. For the longest time I can remember being being envious that my sister seemed to always be dressed in tropical hues, and pretty pastels because it's what complemented her olive skin best. And I told myself I was more suited to deeper, wintery jewel tones. So I never gave a colour like yellow a chance. I walked around shops as a with a strict list about what I could or couldn't wear. But I've discovered that if it makes you feel happy and confident, just wear the damn colour! On my journey across the colour spectrum I've experimented with primary shades I'd never have been daring enough to don before, along with pastel pinks and vibrant oranges. A bit of an artist at heart, I've always had a kinship with colour, but never really been brave enough to give it a go. On the cusp of spring though, now is the perfect time to try something new! I found myself inspired by the colours I saw on a visit to Tilgate Park at the weekend. The first brave few flowers and exotic animals in the park were highlighted beautifully by the glorious winter sunshine - roll on summer I say! But the brief break from the overcast weather gave me the perfect opportunity to try out my yellow jumper for the first time - a wonderful find from Sainsbury's of all places! 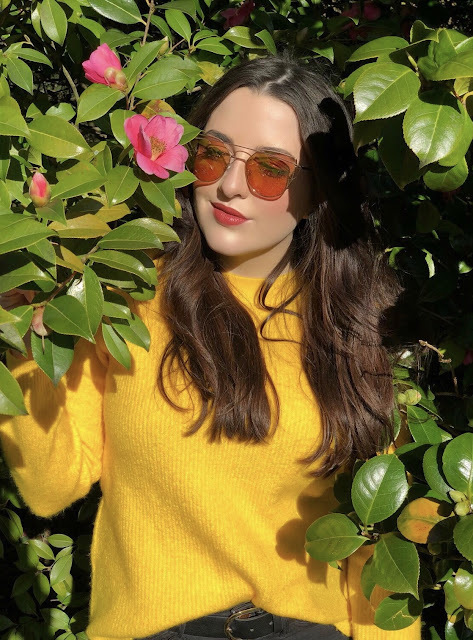 Not only did I feel the bright yellow had a marked improvement on my mood, but I felt super confident too - something I'd never have thought I'd feel, when I thought of wearing yellow during my teen years! Though I'm definitely not ready to part ways with my black clothing, that I'll always hold dear, here's to the colour spectrum, I can't wait to see what summer has in store from you! During the winter months at the start of the year, it can be tough to inject some much needed life into your home. You miss the cosy warmth of your Christmas decorations, but yearn for spring flowers and pastel hues - it's a really confusing few months until that sun shines again. So I found the perfect way to combine both factors, in a cheap and cheerful, easy home décor DIY, that'll literally light up your room! Fans of Beauty & the Beast will see the immediate inspiration from what I’ve created. Whilst I’m not an avid Disney fan (don’t get me wrong I like the films and characters, but I am not Disney mad), I still appreciate the beauty of the single rose in the bell jar in the film. Magical, delicate and beautiful, it’s always captured my imagination, and glass cloches seem to be all the rage now in interior decor, so what better time to recreate the iconic look. I actually got my glass cloche from IKEA for an absolute bargain, along with the flower (I chose a pink carnation over a classic rose as they're my favourites and I wanted to put my spin on it). In total the pair cost me just over £8, which in my books is pretty damn cheap. Cutting the plastic stem down to size, I decided it needed that little 'magical' element to catch the eye, so I dug out my old wire lights (these are pretty similar) I purchased at Christmas and wound them around the inside of the jar. Sadly the power pack is a little chunky so I'll probably replace it at some point, but for a thrifty, quick-fix I'll ignore it for now. The result, when the lights are turned on, is like little fireflies inside the jar. Very magical. Very Disney. And all for under £10! So there we have it, an easy DIY that costs under £10! The only problem you'll have is deciding where to place it. I personally love this as a bedside lamp / nightlight, but it could easily work on a kitchen window sill or as a pretty coffee table centre piece - get creative and use your imagination! Yesterday evening I attended yet another craft event run by Kirsty from Make Do & Trend, hosted at Pretty Things in Horsham. If you regularly check in with my blog, you'll remember that before Christmas I went to a Kitsch Christmas Wreath Making themed one (which you can read here). And I have to say this event was just as fabulous as the last! Inspired by Valentine's Day, we were creating our own box frames in this workshop. Before the event each of us was allowed to select a four-letter word to feature in our frame, since it was Valentine's inspired, most of us went for the word 'love' whilst others experimented with their vocabulary! What I loved most about this idea though is how versatile it is, you could frame anything from home or baby, to even a gardening themed one with grow - you have complete freedom on this one! From then on there was some painting and papercraft, in order to achieve our gorgeous little frames! I have to say I was in my element with the vintage floral papers, everything was so inspiring and I can definitely see myself giving all my friends and family one of these frames as future gifts. No craft session is complete without a generous slice of cake from Pretty Things though! (If you haven't heard of it, it's basically Horsham's equivalent of Peggy Porschen!) After the mermaid cake I sampled last time, this time I decided to trial the rainbow cake - tantalising for the tastebuds and a feast for the eyes! As a group we actually got so into our crafting that we were completely surprised to find that it was nearly time to leave for the evening, I guess it's true that time flies when you're having fun. 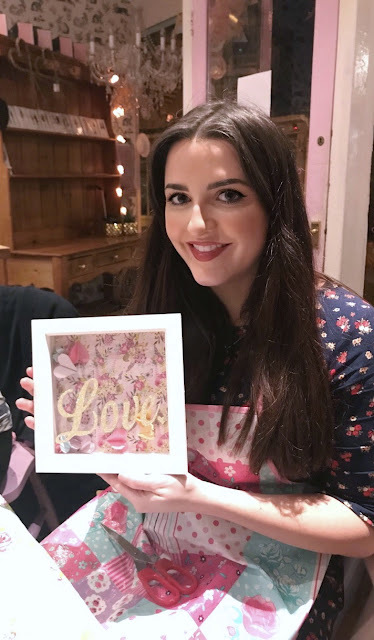 I really cannot recommend Kirsty's workshops enough though, whether you're a crafting extraordinaire, or just starting out her workshops really are suited to all abilities - with a little extra support from Kirtsy herself if you find yourself getting muddled! It's a fun, friendly environment, with like-minded individuals to just relax and craft with excellent cake - musn't forget the cake!